This easy jigsaw puzzle quilt pattern walks you through the puzzle quilt construction process step by step. Sew a colorful scrap quilt or choose a color scheme to keep your layout nice and tidy. 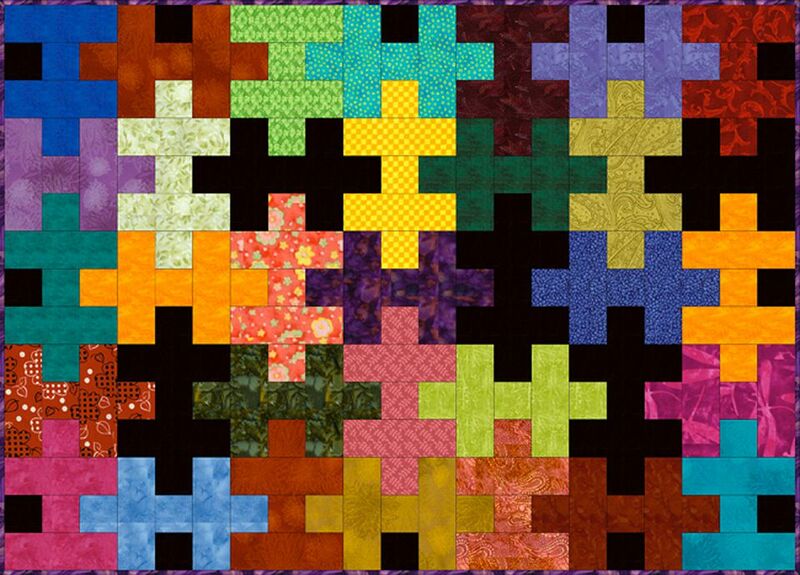 Jigsaw puzzle pieces emerge when adjacent parts of traditional 'H' quilt blocks are rotated. The little squares along each block's outer midpoints become the tabs that lock the puzzle blocks in place. 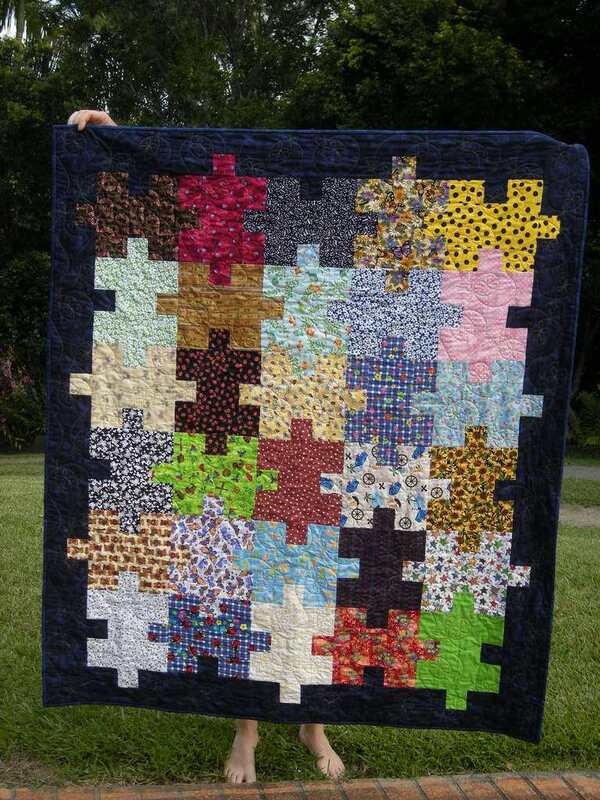 The jigsaw puzzle quilt is most effective when you make a scrap quilt because patches required for individual blocks are small, making the puzzle quilt a perfect stash-busting pattern. Repeat fabrics or devise a controlled color palette if you prefer. Insert a few black or white puzzle pieces to add visual depth and help those areas drop out of the design. Squares that end up on the outer perimeter of the quilt shown are all black to help define the pieces they touch. The small quilt is made with 6" square quilt blocks and finishes at about 30" x 42". You'll need a strip that measures at least 2-1/2" x 22" for each H block you plan to use in the quilt. You can use a rotary cutter to cut long strips of fabric. Make about 170 running inches of double fold quilt binding in a width that's sewn to the quilt with a quarter inch seam allowance. About 1-1/4 yards of quilt backing if using standard quilting fabric. About 40" x 52" of quilt batting. Sew 35 blocks (7 rows of 5 blocks each as shown on page 1) to make a quilt that finishes at about 45" x 63". Either (1) or (2) additional 3-1/2" x 3-1/2" squares as determined by layout; do not cut yet. Sew 35 blocks (7 rows of 5 blocks each as shown on page 1) to make a quilt that finishes at about 60" x 84". Either (1) or (2) additional 4-1/2" x 4-1/2" squares as determined by layout; do not cut yet. Cut (2) 2-1/2" x 6-1/2" bars and (1) 2-1/2" x 2-1/2" square of each H block fabric from leftover scraps or the long strips referred to in yardages. You will need either (1) or (2) more 2-1/2" squares of each fabric, depending on the block's final resting place in the quilt, but do not cut them yet. The drawing illustrates three rows of the quilt. You'll need fabric for 35 blocks to make the entire quilt. Using a design wall, arrange the three patches cut for each block to form a series of H shapes. Each row is made from five H quilt blocks, and adjoining H blocks are rotated. Move H shapes around until you are happy with the layout, adding some black puzzle blocks if you like. Sometimes it helps to leave the room for a while and examine the layout again when you return. Are you still happy with the quilt's appearance? If not, rearrange the blocks again. Once you're happy with the jigsaw puzzle quilt's layout, cut the remaining patchwork. The squares are either black (for gaps along the quilt's outer edges) or the color of the puzzle piece that inserts into the opening of an adjacent H.
Only three rows are illustrated here — make six. Cut 2-1/2" x 2-1/2" squares to complete each puzzle block. Sew the three squares in each block's middle section together and press seam allowances in any direction. Sew each block's two 2-1/2" x 6-1/2" bars lengthwise to opposite sides of the middle section. Press seam allowances towards the long bars (upper row of the illustration shows block components). Keep your design intact by working on one quilt block at a time and placing it back into the layout after it is assembled. When all blocks are complete, sew blocks in each row together. Press new seam allowances in adjoining rows in opposite directions. Join the rows. Press. Mark the top for quilting if necessary. Sandwich with batting and backing. Baste the layers together and quilt. Remove excess backing and binding. Sew binding around the edges of the quilt.